As we continue to mark our twenty fifth year in north Minneapolis, as an inner-city monastic presence, we highlight sacred elements of our community. 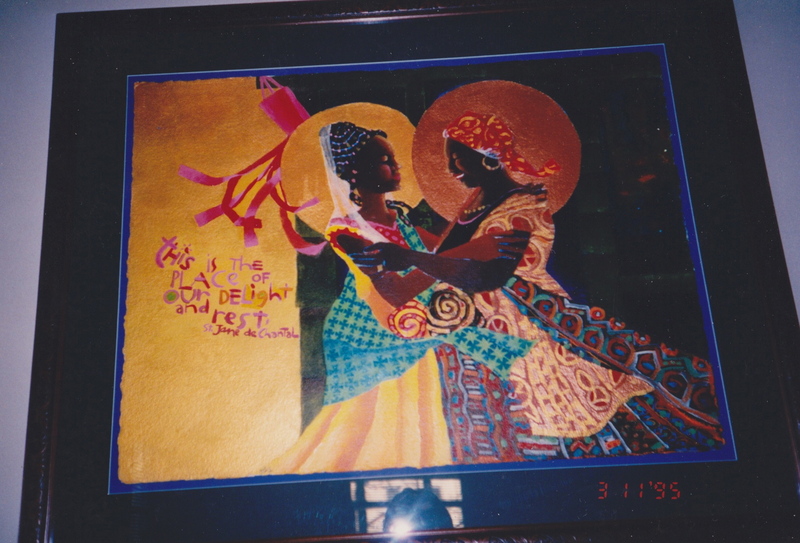 This blog features images of artwork in our Fremont and Girard Houses that comprise some of the inspiring spaces where we pray daily. Perhaps this work might move you, too? We invite you all to come and see it in person! Come and pray with us this year! This stained glass window was created and installed in the Girard House dining room by John and Mary Scanlon in 2008. A piece of purple glass with an unusual image in its coloring the resembled a Visitation of Mary and Elizabeth was the inspiration for its creation. This gift and its presence in our house offers inspiration and hope. Around the year of 1998 we planted a peace pole in our backyard at the Fremont House. 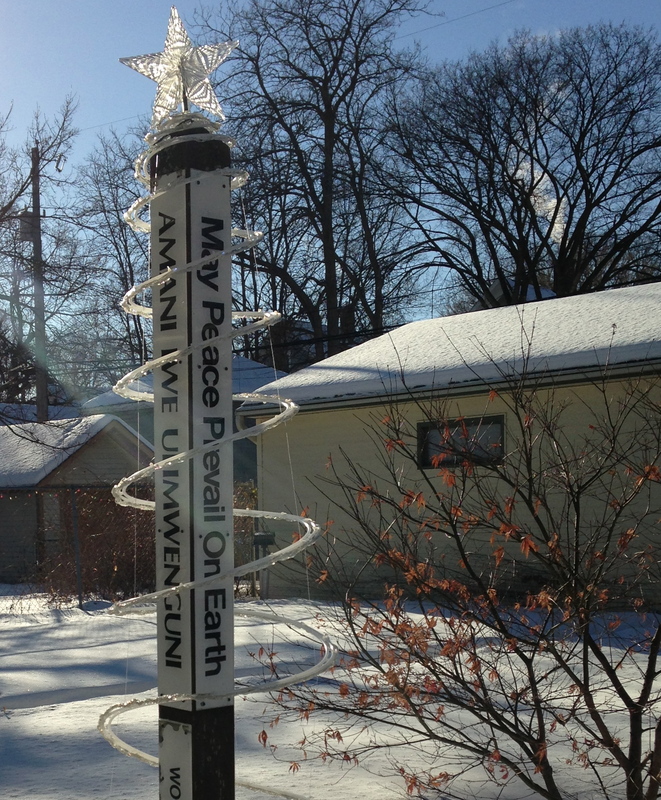 One of our Visitation Neighbors, Paulette Sankofa, had a project to spread these peace poles throughout our neighborhood. She knew that being a gentle presence was our focus as it was hers: An alternative to violence around us. 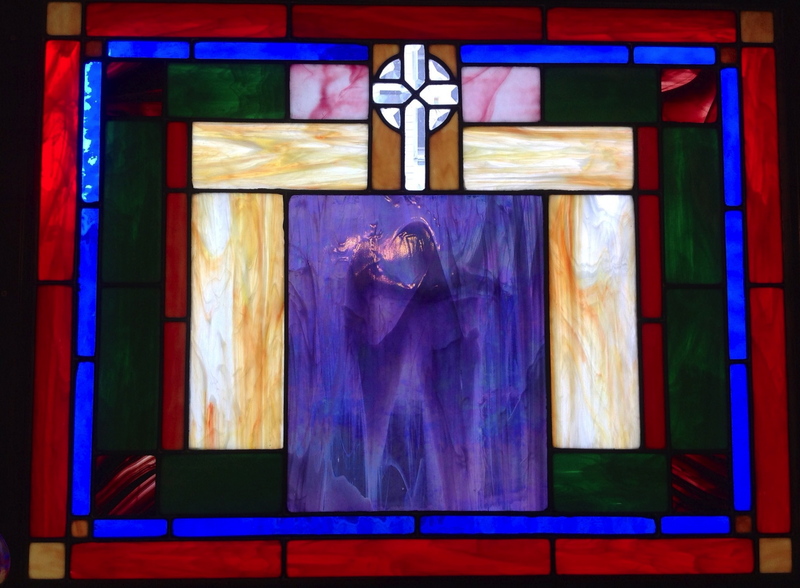 Donated to us by the artist Ditriech Spaun, and hung by him in our chapel on Fremont behind the Crucifix, this window could depict a flame, a flower, a dancer. For each one who gazes at it, it is a symbol that draws one into mystery. Brother Michael McGrath, OSFS, who created for us the “Windsock Visitation” that hangs in the Fremont living room, also created a Visitation that hangs in the stairwell at Girard. The women in the painting could be of any ethnic background. He had heard that the initial experience of pregnancy is like a butterfly, here depicted under Mary’s heart. Soon after we had arrived in north Minneapolis, we received a gift from Brother de Paul, who was a tireless worker in Haiti. This creche, carved from one piece of wood in Haiti’s worst slum, has been the centerpiece for every Christmas celebration since then. 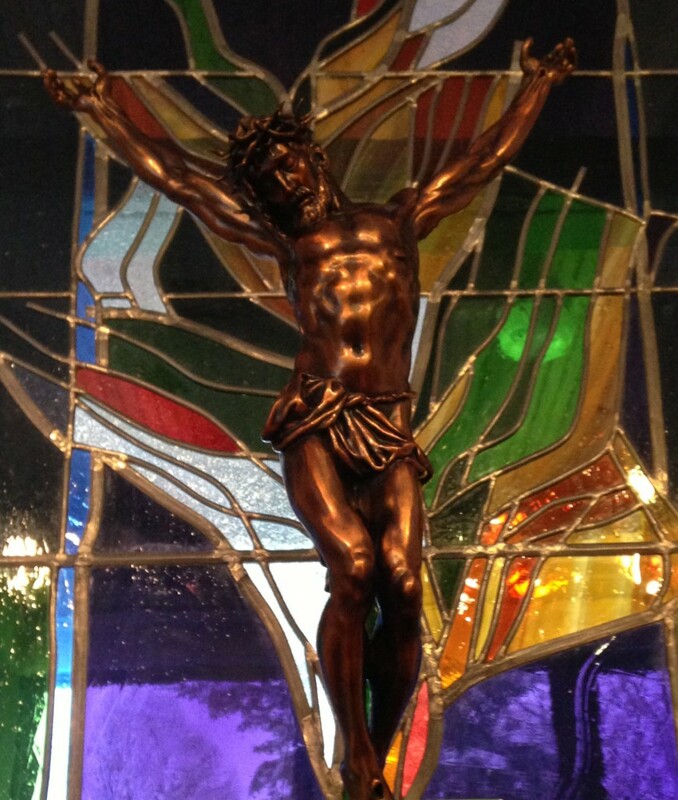 Ask Sr. Mary Frances Reis why she likes this carving so much; she would love to tell you! A most precious gift to us from our St. Louis Community as three of the sister left there to come to Minneapolis, is this wood crucifix. 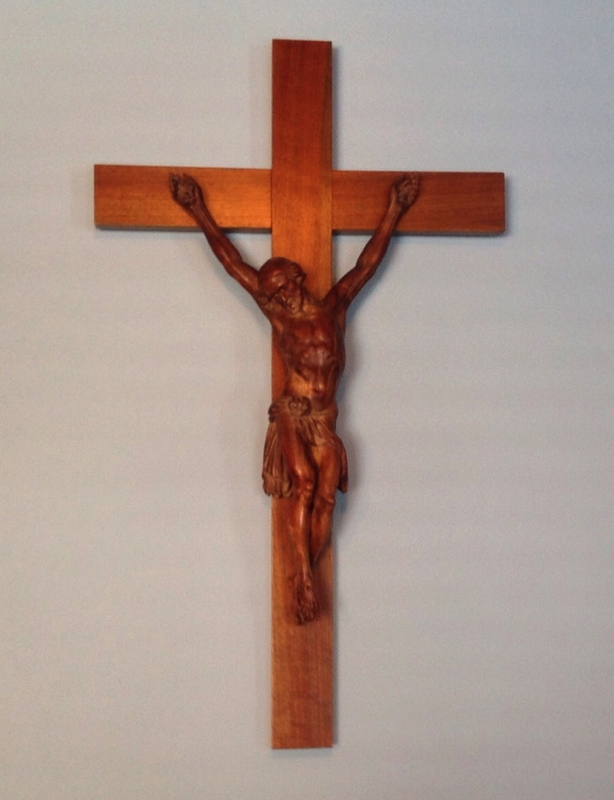 It was probably carved by a prisoner in jail where our monastary chaplain was also a chaplain, so somehow this crucifix was in the sacristy for many years. What happened to the prisoner that he did not finish the work? There is no insignia and no crown of thorns. On the back is written a prayer by St. Francis de Sales and signed by of the members of the community at the time. 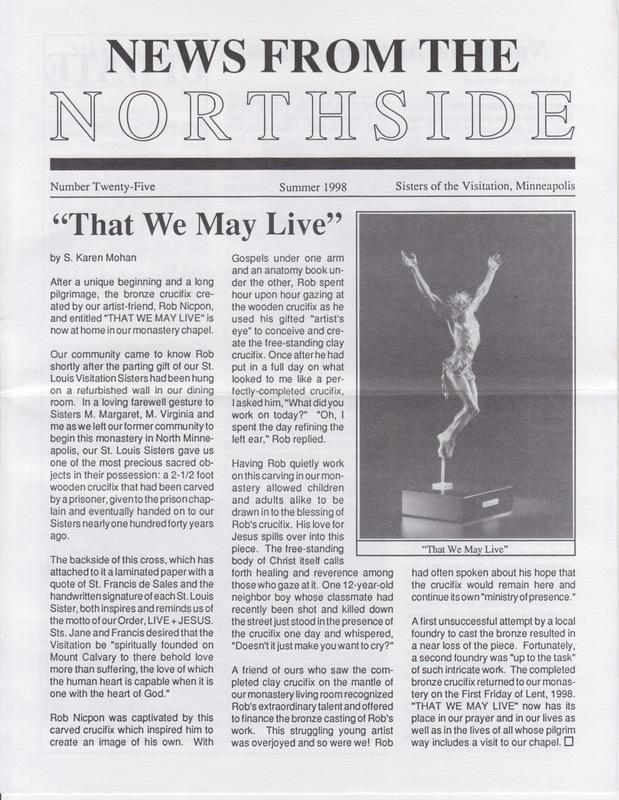 To read more about the Crucifix by Rob Nicpon, click here: Newsletter from Summer, 1998. 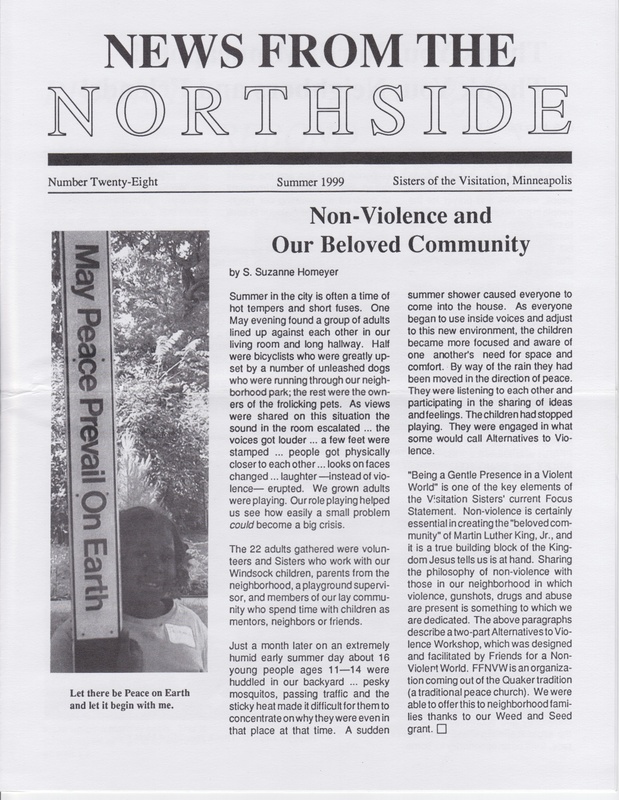 To read more about the Peace Pole, click here: Newsletter from Summer, 1999. 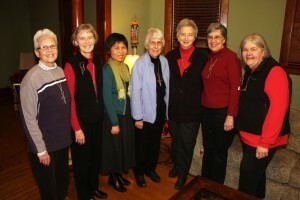 Seasons in the Life of Visitation Monastery of Minneapolis….25 of them! Greetings! In the course of the next 10 months, we the Visitation Sisters of Minneapolis will be gathering up some highlights of the sacred history of this Northside monastery! Where to start? 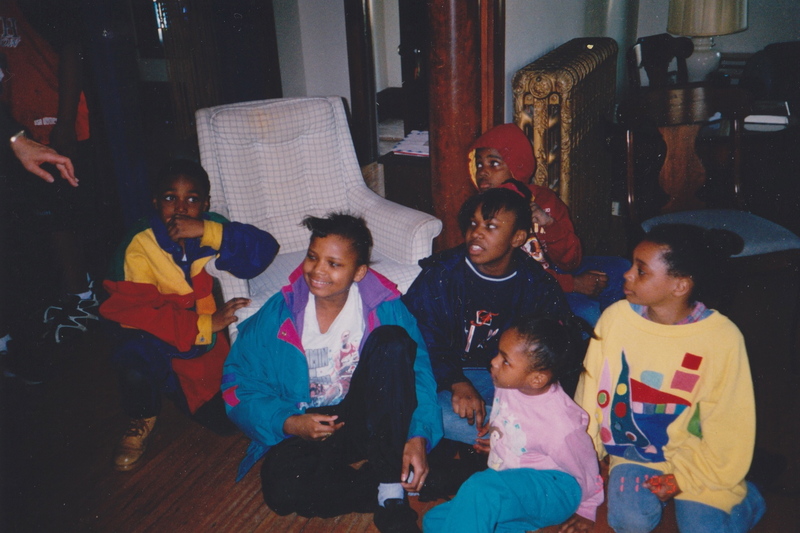 When we first moved into our turn of the century home at 1527 Fremont Avenue North on November 11, 1989, it was the children who discovered us….morning, noon and night they discovered us! We came up with the idea of having a special time each day to welcome them for games, reading, play, prayer and a treat. The signal we devised for ‘kids’ time’ was a colorful windsock which we hung out from 3:30 to 4:30. Eventually this became known as ‘Windsock Time’; on any given day somewhere between 12 and 15 children showed up. One of the most precious art pieces we have in our monastery is the original painting of the Windsock Visitation by Brother Mickey McGrath, OSFS. * (Newsletter #16, Spring 1995.) Inspired by the windsock as symbol of hospitality for children, Mickey created a masterpiece which speaks volumes to all who come to our monastery. By now, prints of the Windsock Visitation grace homes and work places around the world. After 20 years, ‘Windsock Time’, as it began, is no longer a part of our daily routine. 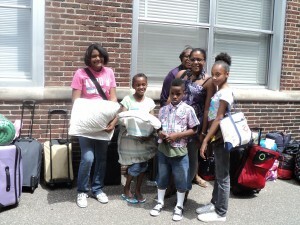 However, the relationships continue and our Salesian way of hospitality and welcome live on in ever newer forms. Thus, the windsock has become our primary logo. For several years, I enjoyed a deep friendship with a doctor who specialized in taking pictures of people’s hearts. Echocardiography is the practice of using sound waves to capture images of our hearts that, in turn, help diagnose abnormalities. 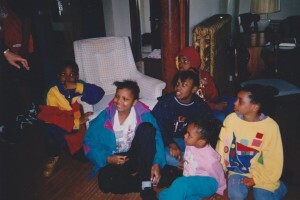 To this day, I think of our friendship as a simultaneous invitation by God to meditate deeply on the pictures I’m afforded of people’s hearts; I think about how this friendship informs my vocation to tune into Love pouring forth through all — no matter who they are, where they are from, how well I know them, or how much I adore them. 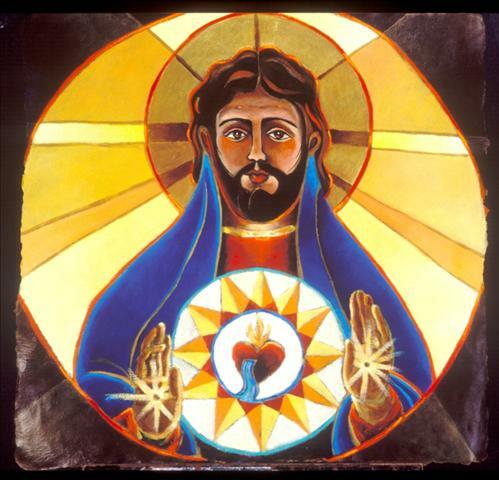 On this Feast of the Sacred Heart of Jesus, I return to this image of Christ’s wounded heart, this pierced organ at the center of his body, that simultaneously reflects all of our wounded natures, and the gifts of Love, Gratitude, Mercy and Forgiveness that we might offer to one another, through Jesus. “Most Catholics are aware of devotion to the Sacred Heart of Jesus. But not as many know that a Visitation Nun, born in France in 1647, was instrumental in promulgating the spread of this worldwide devotion. Saint Margaret Mary Alacoque, entered the Visitation Community at the Monastery of Paray-le-Monial, France. It was there that she began to receive in her prayer, visions of Jesus, asking her to share the message of his heart burning with deep love for his people. As we prepare for this feast day on Friday, I invite you to consider taking a snapshot of your own heart. What figurative images come into focus as you reflect on your spiritual core? What blockages might exist? What pathways are open for love to pour forth? How do you imagine Christ’s heart to appear? Can you see the crucified and resurrected one alive in your being? Can you see Love alive in your neighbor? In your partner? In your family members? In the stranger walking down the street? Can you fathom Jesus’ love and mercy for the person who would be your enemy? What does this feast day meditation stir up in your own being? 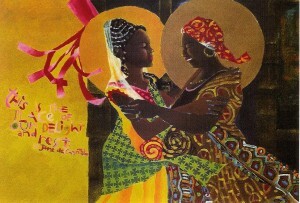 How do you celebrate the Feast of the Visitation? This Thursday we celebrate the Feast of the Visitation, the story that is our order’s namesake, that anchors our charism and presence in communities all over the world — especially in north Minneapolis. This feast remembering Mary’s visit to her older cousin Elizabeth, who is six months pregnant, holds the beautiful tenants of our communities’ faith: for as members of the Visitation, we all work to tune into one another as vibrant, life-bearing, divinely-inspired creatures; we look for the Elizabeth in all who come to our door; we seek to be Mary, emulating her in relationship with each other — we look to receive the gifts of Our Lady and her cousin in how we are counseled, mentored, visited by all who knock and enter. 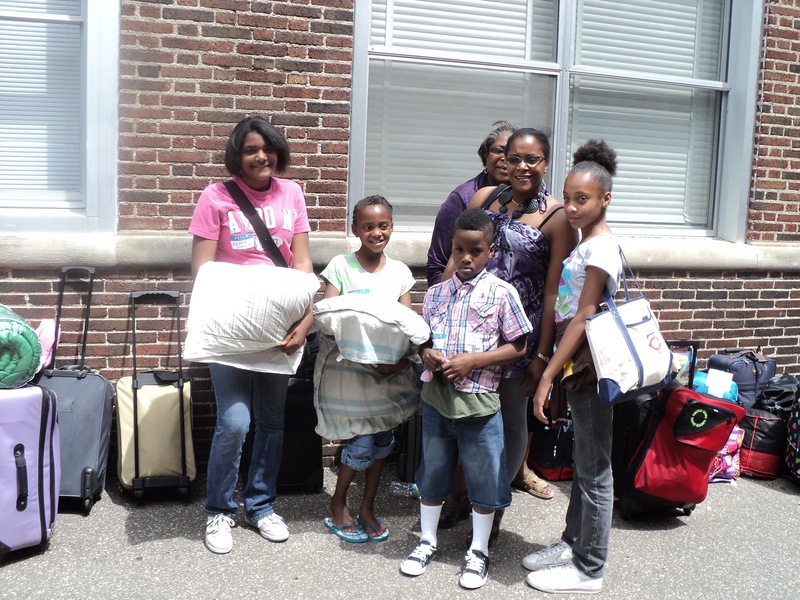 –Thursday marks the Visitation Senior Students’ last day of service on the northside; we will have a ceremony honoring and acknowledging the way these young women have been among us for two weeks. Can you imagine the faces of Mary and Elizabeth as we convene at St. Jane House and reflect on our time together? –Thursday evening we bury our longtime friend and prayer companion, Deacon Dale Timmerman, who passed away on the eve of Pentecost. Will you join us in celebrating Dale’s northside presence to us, along with his wife Nancy’s, as a Visitation one? As we literally mark this feast day in our community, squeezing in a ritual of sorts in our afternoon prayer, we are joined by our newest community member, who comes to us from another religious Order altogether and creates for us another opportunity to be the Visitation. Sr. Mary Mao, our housemate and dear Maryknoll sister from China, who lives with our community while she completes her graduate coursework, allows us to breathe and receive Mary/ Elizabeth energy as women religious all over the world do. May we continue to grow in our relationship and be nurturing of life-giving love and witness to our Lord! How do you see Mary and Elizabeth alive in your world, work, home? Join us in prayer, as we pause to thank God for all the ways that divine “Visitations” are a part of our daily lives. May: A Month Celebrating Mary! It’s May, friends! A month during the liturgical year when Catholics devote time to our Blessed Mother. I’m pausing today to think about the various ways I do this, and considering ways that I might grow in my prayer and devotion to Mary. Perhaps some of this will resonate with you? I started my day driving across town in traffic that had me honking — within four blocks of my St. Paul residence – after being cut off in my lane, en route to the Monastery. Immediately, I heard: “Time to pray.” Without much thought, I began a decade of Hail Mary’s that brought a calm to my angered spirit. I found myself smiling, eased up on the gas pedal, and released my grip on the wheel as the words, “Full of grace, the Lord is with thee” went through my mind and heart. As a pre-teen and adolescent growing up in northeast Nebraska, Mary made few appearances in my prayer life. It was at my friend Jeanne Pfiefer’s house, however, that the rosary became part of my spiritual consciousness. Following meal times at Bud and Alice’s house, where their combined brood numbered ten, we were invited to clear dishes and then return to the table, where our litany of Hail Mary’s began. I remember being 14 and thinking, “Huh. This doesn’t happen at my house.” Jeanne seemed a little pink in the face the first time I was invited to join in the prayer, (an apologetic or self-conscious peer? ); but I reveled in the experience. I loved sitting at the table with the Pfiefer-Ramaekers clan and being included in this holy ritual that seemed to anchor their family. It was an “out of the ordinary” thing for me, and I marveled at how Bud and Alice lead their choir of children in this manner. It would be 16 years later before those rosary experiences would come home to me again and inspire my faith life and thinking in a new way. At the untimely death of Jeanne’s parents, I heard her older brother bring up this rosary ritual during the eulogy of Bud and Alice. Oldest living son Terry Pfiefer recalled the story, asking his step-father why he and his mother insisted on this after-dinner prayer each night. “Why do we pray to Mary?” he asked. That explanation has stayed with me ever since. I wonder, what Marion prayers are part of your faith life? How does the rosary inspire or inform your spiritual routines? Who else likes to pray the rosary in traffic or while they are in tense spots? I wonder if the Vis Sisters might list all the Mary-directed prayers that are part of their office? During this month of May, I am striving to tune in and engage Mary more in my heart and mind. Will you join me in this intentional manner of prayer?